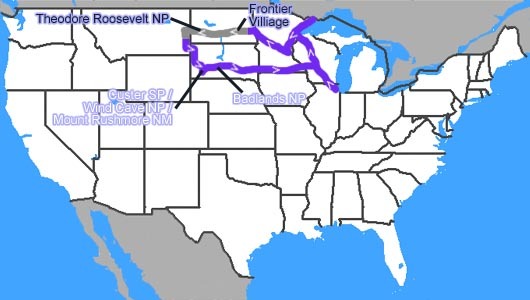 My 1996 Black Hills Vacation - 7 (14) days, 3,450 miles. Part 1 - Minneapolis, Minnesota to Montana. It was Summer, 1996, and it was time to plan my annual fishing trip. I was still working long weeks, and was determined to take a two-week vacation, and forget all about that thing called "responsibility". High speed internet access didn't exist back then except in specialized places, and cell phone service wasn't available in a *lot* of places, so you really could take a two week vacation. But this year would be a little different, and would change my vacation habits forever. It would be my first road trip, for no other reason except to just get in the car and go see stuff. My car was new, and I wanted to take it on the Montanabahn before it went away. The writing was on the wall; court challenges on what "Reasonable and Prudent" meant. It meant that sooner or later there'd be a speed limit in a state where there's a whole lot of...nothing...between a bunch of really interesting places to visit. I think there was also a desire to see Mount Rushmore, if for no other reason that it was somewhat near the Montanabahn, and we didn't want to come home the same way we went. And that, I believe, was the extent of the planning. The web didn't really exist yet, and we depended on tourist information areas for actual information (today they're more bathroom breaks), and just hoping a hotel in the area would have a room. I do road trips a lot differently now. See How I plan a Road Trip. It was a speed run West, but due to the time spent at the airport, only made it to Fargo, North Dakota. We made it as far as Fargo the first night, and stopped at the FM visitor center to pick up the local tourist propaganda. We checked the sights down I-94, and we determined Frontier Village would be our first stop. Anyone who's driven more than a state or two away on a vacation has seen 'em. Tourist traps. Places that have some claim-to-fame or some attraction that the locals think might make them some tourist dollars. They're never a destination, but rather places of interest along the way for those who are on the way to a destination. I mean let's face it. Would the destination of your vacation be the World's Largest Buffalo? But as someplace to stop to take a break from the drive, some of these places are great. I love playing tourist. I stopped in again during my 2006 Pacific Northwest Trip, since I spent the night in Jamesville, but that's another road trip. Early in the morning on September 8th of 1883, a shrill, nearsighted guy who insisted he be called "Mr. Roosevelt" stepped from a train in the Dakota Territories by the Little Missouri River. He was recovering from a bought of cholera, and was determined to shoot himself a buffalo before the species vanished from the plains. After days of hunting in cold driving rains, he shot his buffalo. A year later, after his mother and wife died within hours of one another, he returned to the North Dakota Badlands to bury his sorrows, and became a cattleman. The North Dakota Badlands, right outside of Theodore Roosevelt National Park (North Unit). Theodore Roosevelt National Park was our next stop. To tell the truth, I think TRNP was the second National Park I'd been to, and only because it was on the way to the Montanabahn. (The first was Hot Springs, I believe.) But it was a spectacular place to visit. This is where TR's conservationist attitudes developed, and formed his convictions that would be implemented later in life while President. While it is where TR had his ranch, and lived during his ranching days, it's really the preservation of the Little Missouri Badlands, a desolate barren area of Northwestern North Dakota. 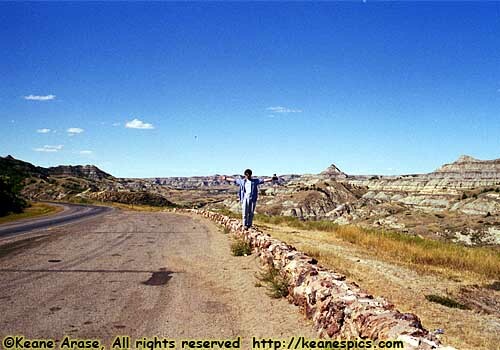 Just off of I-94, in the guise of a rest area, is part of the South Unit of TRNP called Painted Canyon. It's probably the part of the park that most visitors see, since it's the most accessible. It's right there. Just look to your right on the way to the bathroom and be amazed. It's one of those places that begs to have a time lapse camera capture the canyon from morning to night. We stayed the night in Medora, ND, the town just outside the South Entrance to the park. It's only a few miles from Painted Canyon, so we went back for the sunset. Since the Painted Canyon area and the entrance to the South Unit is just off I-94, I've stopped there the two other times I was down this way, in 2001 and 2006. The South Unit gives you a better idea of what happens when layers of volcanic ash gets washed away by water. It's not as spectacular as the North Unit, but it's not 50 miles out of your way, either. I think this is the place we saw our first prairie dog town, too. Cute, fuzzy little rodents that are universally hated by the ranchers. Lewis and Clark's entire expedition took an entire day out to capture one of these creatures, never before seen by Americans. They sent it back to Washington where it lived it's life in what is today, Independence Hall in Philadelphia. The night was spend at a Quality Inn in Rapid City, SD. I won a few bucks at video poker at the bar, enough to cover the drinks, I think. End 1996 West Trip - Part 1 of 2.